Iraqi forces say they have now wrested control of all areas of Kirkuk province from Kurdish Peshmerga fighters, following fierce fighting. They say they have retaken Alton Kupri, the last Kurdish-held area. There has been no Kurdish confirmation. A BBC correspondent at the scene witnessed rocket, artillery and machine-gun fire. Iraqi forces have this week taken over swathes of territory held by the Kurds since 2014. Army and allied militia launched an operation which saw Kurdish forces pushed back into the officially recognised autonomous Kurdistan Region of Iraq (KRI). The oil-rich province of Kirkuk, which includes ethnically mixed Kirkuk city, is claimed by both the central government in Baghdad and the KRI. Iraqi Prime Minister Haider al-Abadi ordered military action after the Kurdish government held a referendum which overwhelmingly backed independence. Mr Abadi had declared the vote illegitimate. An Iraqi military spokesman said counter-terrorism and federal police forces, as well as the Popular Mobilisation - an Iranian-backed paramilitary force - had advanced on Alton Kupri at 07:30 (04:30 GMT). 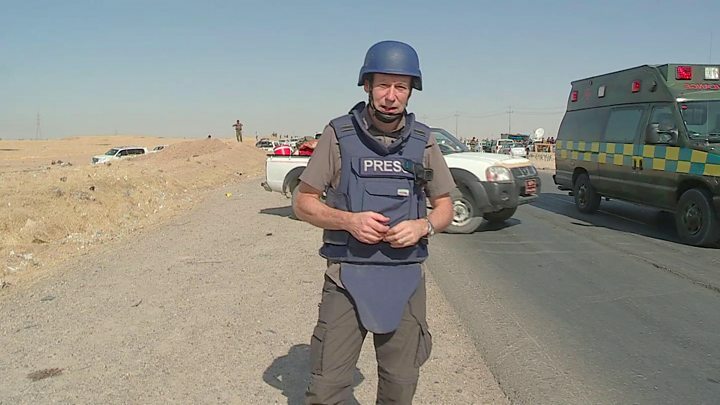 The BBC's Richard Galpin, who was at a checkpoint in the area, says there was a "major outbreak of fighting" with large numbers of military vehicles and soldiers heading to the scene. The town, known as Perde in Kurdish, lies on the northern edge of Kirkuk province, about 50km (30 miles) south of the Kurdish capital, Irbil. The latest action comes a day after an Iraqi court ordered the arrest of Kurdistan's vice-president for calling troops sent to Kirkuk this week "occupying forces". Peshmerga forces had controlled much of the province since 2014, when Islamic State militants swept across northern Iraq and the army collapsed.